Beauty queens have always advocated ‘world peace' in the hope their words alone would wipe out global poverty, environmental catastrophe and hatred. But these words have likely been somewhat lost on the young wannabe princesses who aspire for Baywatch-style bikini bods. Well perhaps, and I do say perhaps lightly, the Miss Earth Beauty Pageant can refocus beauty ideals across the lands to highlight the necessity for clean beaches rather than bleach clean teeth. Perhaps. Any ‘green, glam and gorgeous' ladies out there who would like to represent the UK in this years 2009 Miss Earth pageant visit the website to register. Four country winners will be chosen. Judges will be looking for beauties who are ‘informed, goal-oriented and committed to playing a part in preserving and protecting the environment for future generations'. 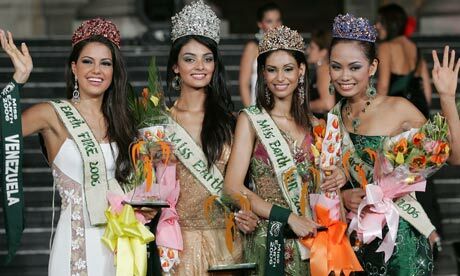 The crowning ceremony for Miss Earth UK 2009 will be on Saturday 22 August. Judges for Miss Earth UK include the Sugababes, designer, Scott Henshall; Club4climate founder, Dr Earth; supermodel, Hofit Golan and Friday Night Project presenter, Aisleyne. Any event that brings attention to keeping our natural world safe and anyone who wishes to promote mother earth is well worth a look in we think - especially if they go organic!